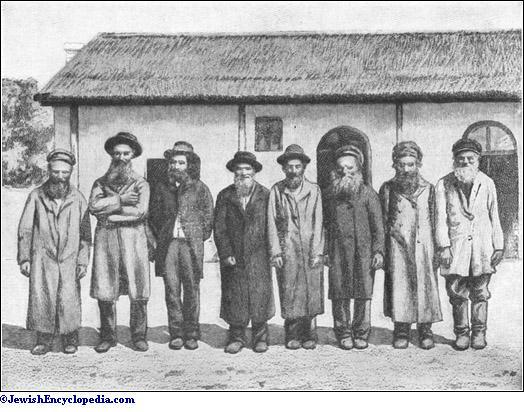 Excepting certain settlements of Jewish farmers in Brazil referred to elsewhere (pp. 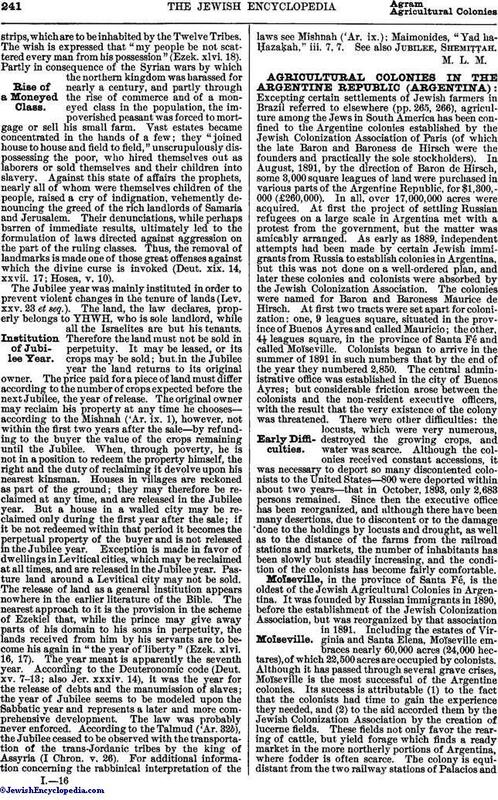 265, 266), agriculture among the Jews in South America has been confined to the Argentine colonies established by the Jewish Colonization Association of Paris (of which the late Baron and Baroness de Hirsch were the founders and practically the sole stockholders). In August, 1891, by the direction of Baron de Hirsch, some 3,000 square leagues of land were purchased in various parts of the Argentine Republic, for $1,300,000 (£260,000). In all, over 17,000,000 acres were acquired. At first the project of settling Russian refugees on a large scale in Argentina met with a protest from the government, but the matter was amicably arranged. 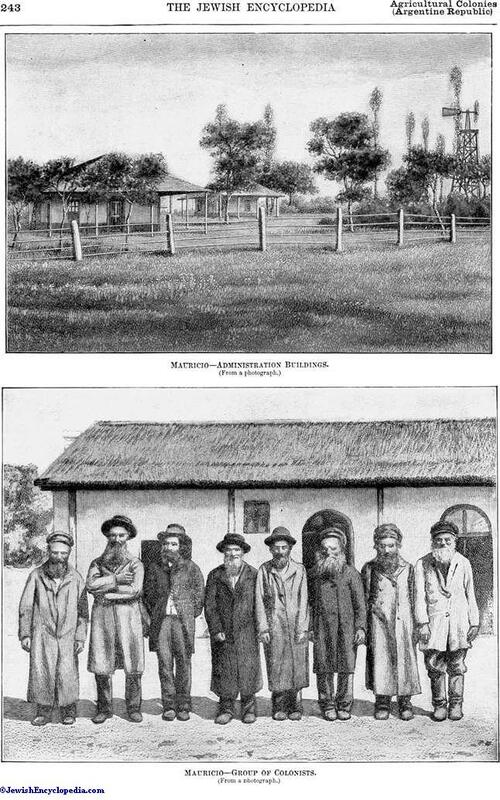 As early as 1889, independent attempts had been made by certain Jewish immigrants from Russia to establish colonies in Argentina, but this was not done on a well-ordered plan, and later these colonies and colonists were absorbed by the Jewish Colonization Association. The colonies were named for Baron and Baroness Maurice de Hirsch. At first two tracts were set apart for colonization: one, 9 leagues square, situated in the province of Buenos Ayres and called Mauricio; the other, 4½ leagues square, in the province of Santa Fé and called Moïseville. Colonists began to arrive in the summer of 1891 in such numbers that by the end of the year they numbered 2,850. The central administrative office was established in the city of Buenos Ayres; but considerable friction arose between the colonists and the non-resident executive officers, with the result that the very existence of the colony was threatened. There were other difficulties: the locusts, which were very numerous, destroyed the growing crops, and water was scarce. Although the colonies received constant accessions, it was necessary to deport so many discontented colonists to the United States—800 were deported within about two years—that in October, 1893, only 2,683 persons remained. Since then the executive office has been reorganized, and although there have been many desertions, due to discontent or to the damage done to the holdings by locusts and drought, as well as to the distance of the farms from the railroad stations and markets, the number of inhabitants has been slowly but steadily increasing, and the condition of the colonists has become fairly comfortable. Moïseville, in the province of Santa Fé, is the oldest of the Jewish Agricultural Colonies in Argentina. It was founded by Russian immigrants in 1890, before the establishment of the Jewish Colonization Association, but was reorganized by that association in 1891. Including the estates of Virginia and Santa Elena, Moïseville embraces nearly 60,000 acres (24,000 hectares), of which 22,500 acres are occupied by colonists. Although it has passed through several grave crises, Moïseville is the most successful of the Argentine colonies. Its success is attributable (1) to the fact that the colonists had time to gain the experience they needed, and (2) to the aid accorded them by the Jewish Colonization Association by the creation of lucerne fields. These fields not only favor the rearing of cattle, but yield forage which finds a ready market in the more northerly portions of Argentina, where fodder is often scarce. The colony is equi-distant from the two railway stations of Palacios andMoïseville, which are connected by a good road, affording ample facilities for the transportation of crops to the markets. Moïseville has become a center for the purchase of provisions by neighboring colonists, many Italian settlers resorting to it for this purpose. Mauricio—Russo-Jewish Colony in the Argentine Republic. The colony contains 81 colonists, representing a total of 168 families and 825 persons. These families live in 130 brick houses, nearly all of which are surrounded by groves of fruit-trees and gardens planted by the colonists. 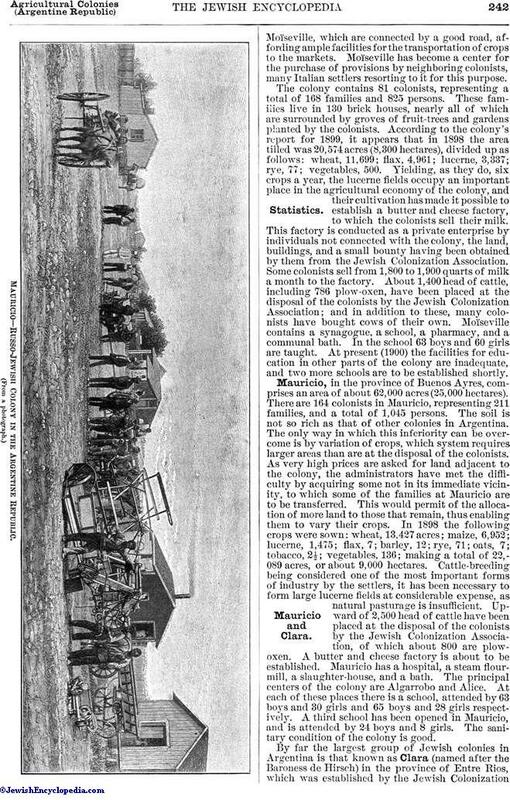 According to the colony's report for 1899, it appears that in 1898 the area tilled was 20,574 acres (8,300 hectares), divided up as follows: wheat, 11,699; flax, 4,961; lucerne, 3,337; rye, 77; vegetables, 500. Yielding, as they do, six crops a year, the lucerne fields occupy an important place in the agricultural economy of the colony, and their cultivation has made it possible to establish a butter and cheese factory, to which the colonists sell their milk. This factory is conducted as a private enterprise by individuals not connected with the colony, the land, buildings, and a small bounty having been obtained by them from the Jewish Colonization Association. Some colonists sell from 1,800 to 1,900 quarts of milk a month to the factory. 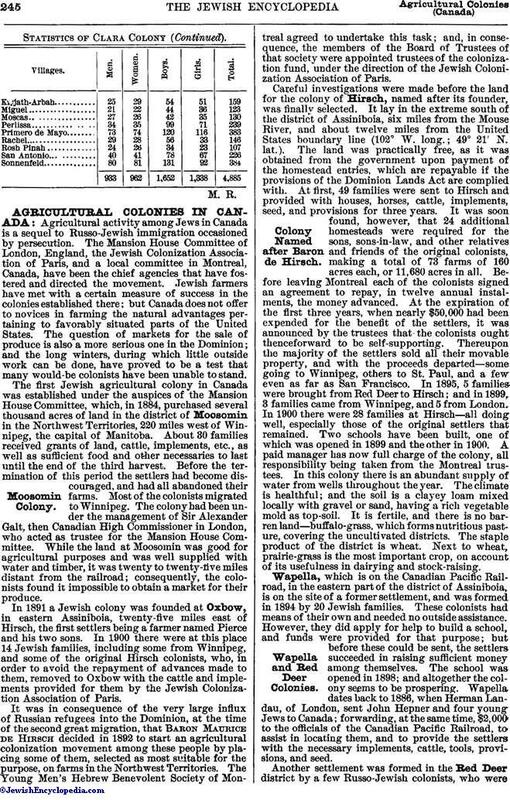 About 1,400 head of cattle, including 786 plow-oxen, have been placed at the disposal of the colonists by the Jewish Colonization Association; and in addition to these, many colonists have bought cows of their own. Moïseville contains a synagogue, a school, a pharmacy, and a communal bath. In the school 63 boys and 60 girls are taught. 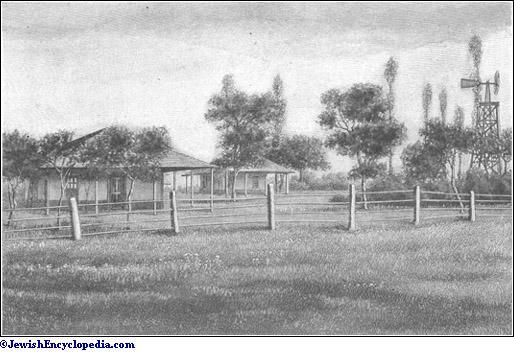 At present (1900) the facilities for education in other parts of the colony are inadequate, and two more schools are to be established shortly. Mauricio, in the province of Buenos Ayres, comprises an area of about 62,000 acres (25,000 hectares). There are 164 colonists in Mauricio, representing 211 families, and a total of 1,045 persons. The soil is not so rich as that of other colonies in Argentina. The only way in which this inferiority can be overcome is by variation of crops, which system requires larger areas than are at the disposal of the colonists. As very high prices are asked for land adjacent to the colony, the administrators have met the difficulty by acquiring some not in its immediate vicinity, to which some of the families at Mauricio are to be transferred. This would permit of the allocation of more land to those that remain, thus enabling them to vary their crops. In 1898 the following crops were sown: wheat, 13,427 acres; maize, 6,952; lucerne, 1,475; flax, 7; barley, 12; rye, 71; oats, 7; tobacco, 2½; vegetables, 136; making a total of 22,089 acres, or about 9,000 hectares. Cattle-breeding being considered one of the most important forms of industry by the settlers, it has been necessary to form large lucerne fields at considerable expense, as natural pasturage is insufficient. Upward of 2,500 head of cattle have been placed at the disposal of the colonists by the Jewish Colonization Association, of which about 800 are plowoxen. A butter and cheese factory is about to be established. Mauricio has a hospital, a steam flourmill, a slaughter-house, and a bath. The principal centers of the colony are Algarrobo and Alice. At each of these places there is a school, attended by 63 boys and 30 girls and 65 boys and 28 girls respectively. A third school has been opened in Mauricio, and is attended by 24 boys and 8 girls. The sanitary condition of the colony is good. By far the largest group of Jewish colonies in Argentina is that known as Clara (named after the Baroness de Hirsch) in the province of Entre Rios, which was established by the Jewish Colonization Association in 1894. 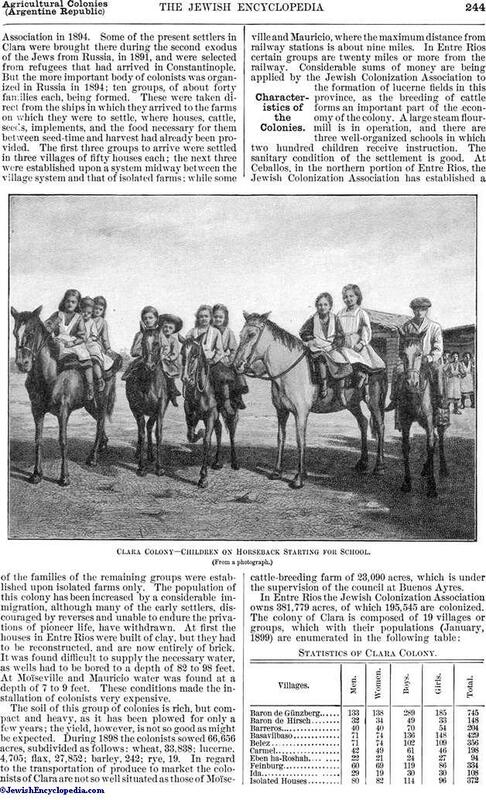 Some of the present settlers in Clara were brought there during the second exodus of the Jews from Russia, in 1891, and were selected from refugees that had arrived in Constantinople. But the more important body of colonists was organized in Russia in 1894; ten groups, of about forty families each, being formed. These were taken direct from the ships in which they arrived to the farms on which they were to settle, where houses, cattle, seeds, implements, and the food necessary for them between seed-time and harvest had already been provided. The first three groups to arrive were settled in three villages of fifty houses each; the next three were established upon a system midway between the village system and that of isolated farms; while some of the families of the remaining groups were established upon isolated farms only. The population of this colony has been increased by a considerable immigration, although many of the early settlers, discouraged by reverses and unable to endure the privations of pioneer life, have withdrawn. At first the houses in Entre Rios were built of clay, but they had to be reconstructed, and are now entirely of brick. It was found difficult to supply the necessary water, as wells had to be bored to a depth of 82 to 98 feet. At Moïseville and Mauricio water was found at a depth of 7 to 9 feet. These conditions made the installation of colonists very expensive. The soil of this group of colonies is rich, but compact and heavy, as it has been plowed for only a few years; the yield, however, is not so good as might be expected. During 1898 the colonists sowed 66,656 acres, subdivided as follows: wheat, 33,838; lucerne, 4,705; flax, 27,852; barley, 242; rye, 19. In regard to the transportation of produce to market the colonists of Clara are not so well situated as those of Moïseville and Mauricio, where the maximum distance from railway stations is about nine miles. In Entre Rios certain groups are twenty miles or more from the railway. Considerable sums of money are being applied by the Jewish Colonization Association to the formation of lucerne fields in this province, as the breeding of cattle forms an important part of the economy of the colony. A large steam flourmill is in operation, and there are three well-organized schools in which two hundred children receive instruction. The sanitary condition of the settlement is good. At Ceballos, in the northern portion of Entre Rios, the Jewish Colonization Association has established a cattle-breeding farm of 23,090 acres, which is under the supervision of the council at Buenos Ayres. 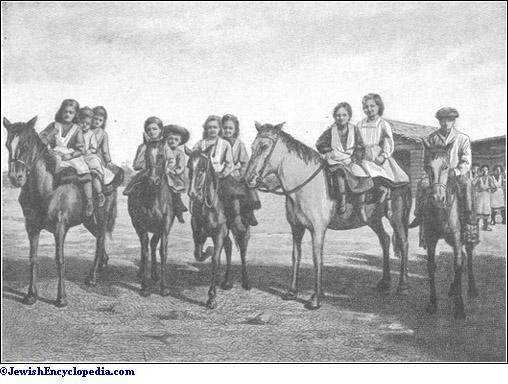 Clara Colony—Children on Horseback Starting for School.